Last week, 6sqft went through the many mansions, predominately lost, along Millionaire’s Row on Fifth Avenue up to 59th Street. Most of this stretch has been converted into upscale luxury retail and corporate skyscrapers, but Millionaire’s Row continued northwards along Central Park, which opened in 1857. Though some have been lost, a significant number of these opulent Gilded Age mansions still stand within this more residential zone. The AIA Guide to New York City calls this area of Fifth Avenue from 59th Street to 78th Street the “Gold Coast,” and rightly so. Walking up 5th Avenue, you’ll first pass the decadent Sherry-Netherland Hotel with its recently uncovered 1927 Beaux-Arts mural and the Stanford White-designed Metropolitan Club, founded by J.P. Morgan in 1891 for friends who were rejected from the old-money Knickerbocker Club. 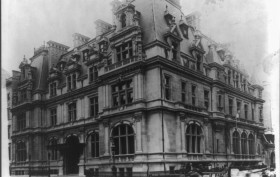 But even before the construction of the Metropolitan Club, a mansion was rising less than a block away on 61st Street and Fifth Avenue. 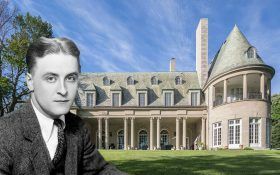 F. Scott Fitzgerald’s cult-classic novel “The Great Gatsby,” about hard-partying Long Island millionaires in the ’20s, was inspired by actual soirees the author attended at mansions along the North Shore, aka the Gold Coast. 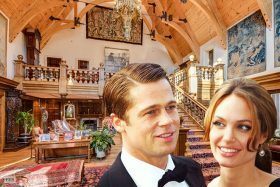 One such locale, a French Normandy-style residence on Sands Point known as the Rumsey-Harriman Estate, is said to have inspired the book’s fictional East Egg, and as the Post first reported it’s just hit the market for $16,880,000. 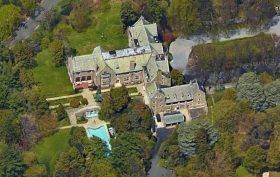 Designed in 1928 by none other than McKim, Mead & White, the 5.3-acre waterfront property was owned by Junior League founder Mary Harriman Rumsey, whose father was railroad tycoon E.H. Harriman and brother New York governor W. Averell Harriman. 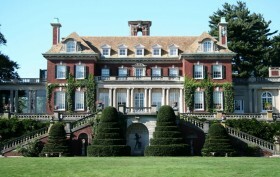 Fitzgerald spent a good deal of time at the home with Rumsey and her family, widely believed to have inspired Gatsby. 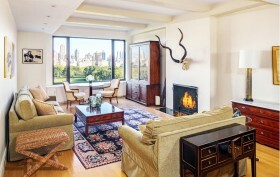 Simpsons star Hank Azaria just bought a piece of Gold Coast property overlooking Central Park. 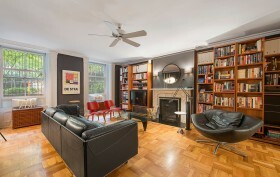 After selling his Soho apartment last year, Azaria has found a new love, in the form of a $9.2 million apartment in a pre-war, Neo-Renaissance building designed by architect Rosario Candela at 75 Central Park West. If it’s at all possible to have Central Park over for lunch, this 3BD/4.5 BA apartment makes it practically customary with oversized windows that make views of the picturesque landmark accessible from the kitchen – along with several other rooms. The stunning space also features large rooms with hardwood floors, beamed ceilings and gorgeous decorative moldings.